These apple cinnamon cookie bites are made with oats, cashew butter and real pieces of fresh apples. A great fall snack and delicious with a bowl of yogurt! I saw a meme on Facebook recently that was a clock. 12, 3, 6 and 9 were labeled as “MEALS” and every hour in between was labeled “TIME I’M THINKING ABOUT NEXT MEAL” or something to that effect, you get the point. It’s my life in a nutshell. Food is on my brain literally all the time. 1- it’s my job and 2- I really like to eat. When I’m on my macro game (ugh…this summer has been rough in that regard. Why is ice cream so tempting?!) my actual meals like breakfast, lunch and dinner are pretty consistent it’s that 3-4pm snack that doubles as my pre-workout meal that makes my head spin. Not a bad kind of spin, just an “omg, there are so many possibilities” kind of spin. It’s the one meal I don’t worry about getting in a serving of vegetables (I more than make up for that in other meals when I eat entire sheet pans of roasted veg) and my brain starts to dream up all the delicious carb + protein options at my finger tips. The one recurring item in this meal: yogurt. Yogurt is usually my go to protein source for this snack “meal” because it’s the easiest way to get healthy, lean protein in without having to chow down on some meat. It’s also a blank canvas for delicious carby toppings. Heyyyooo. I tend to go with 0% in yogurt because to be honest, I want to save my fats for something like nut butter drizzled over my yogurt. 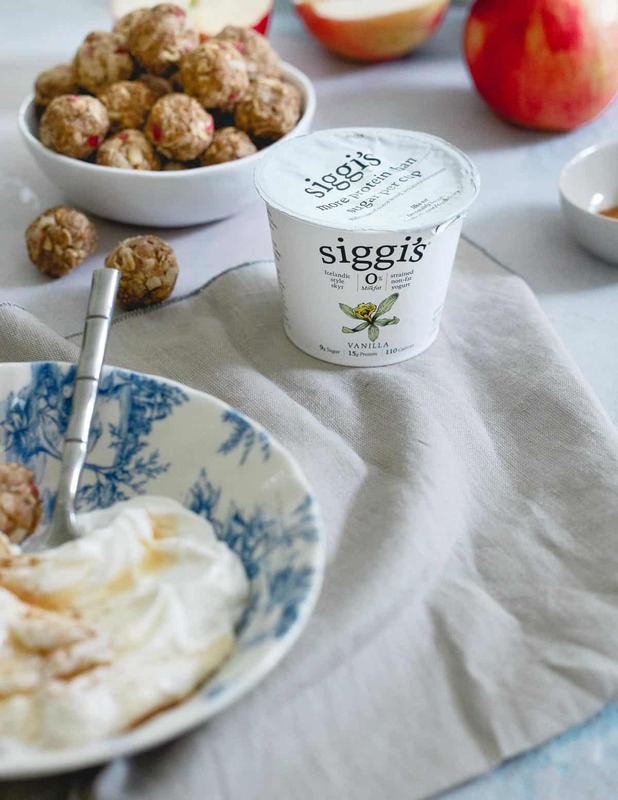 I’ve found siggi’s 0% Icelandic style skyr, to be one of the creamiest 0% yogurts out there and a total game changer when it comes to non-fat yogurt snacking. I love siggi’s “simple ingredients, not a lot of sugar” message because it jives so well with how I eat. The fact that there’s more protein (16g! – perfect serving size) in each cup than sugar let’s me get creative with the carbs in my pre-workout snack and as we transition to fall (it didn’t break out of the 60s yesterday here in NY, um…bye, August?) these apple cinnamon cookie bites are quickly becoming my favorite way to get those in. If I’m not eating a traditional yogurt bowl, I also love their 0% filmjolk drinkable yogurt options (currently obsessed with the raspberry flavor). I could probably have an entire website dedicated to bites/balls with all the possibilities out there (these cranberry orange oatmeal cookie bites and these pumpkin spice chocolate chip bites are some seasonal favorites) and I do realize the internet surely does not need another recipe for them but these are really freakin’ good, guys. Bursting with subtle fall flavors from the fresh pieces of real grated apple and cinnamon they’re combined with that distinctly “cookie dough” taste from creamy cashew butter and almond extract. 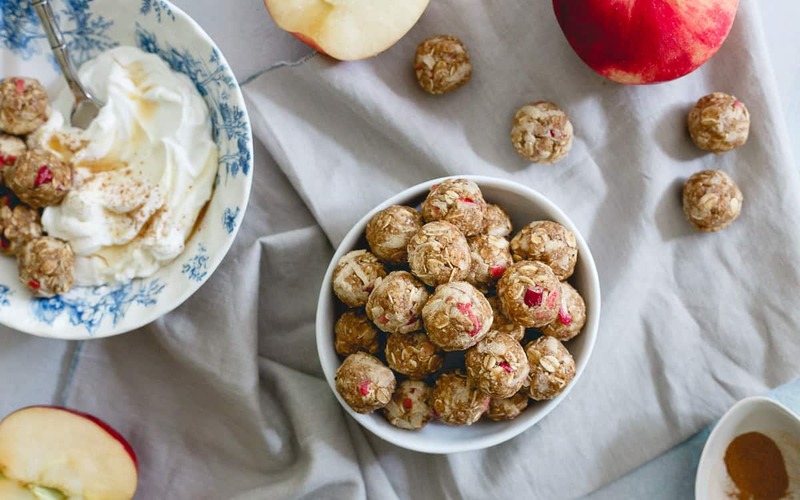 A handful of them in your yogurt bowl snack is the perfect way to get in a healthy dose of protein and carbs and sure to fuel you through a workout or just get you through the afternoon until that next meal. Not that I’m counting down the minute until that or anything. 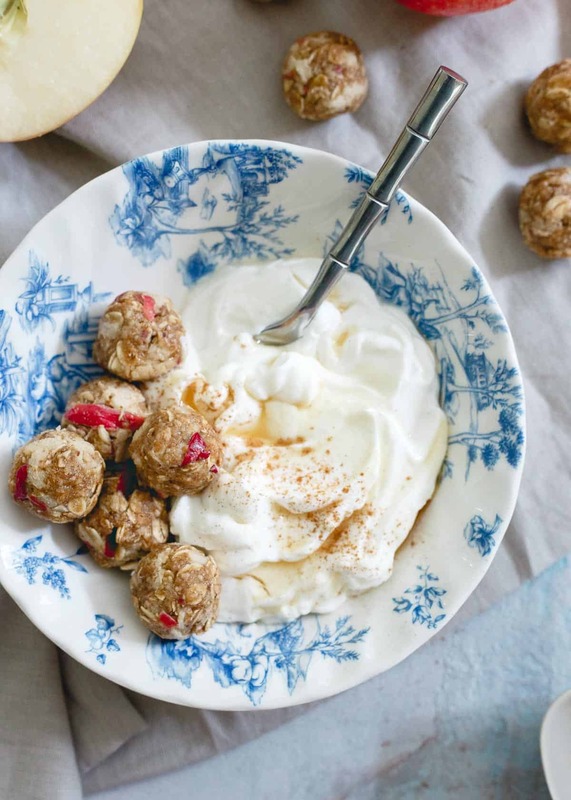 Love this apple cinnamon cookie bites recipe? Try Raw Brownie Bites, Dark Chocolate Kahlua Coffee Bites, and Chia Cherry Crunch Bites. 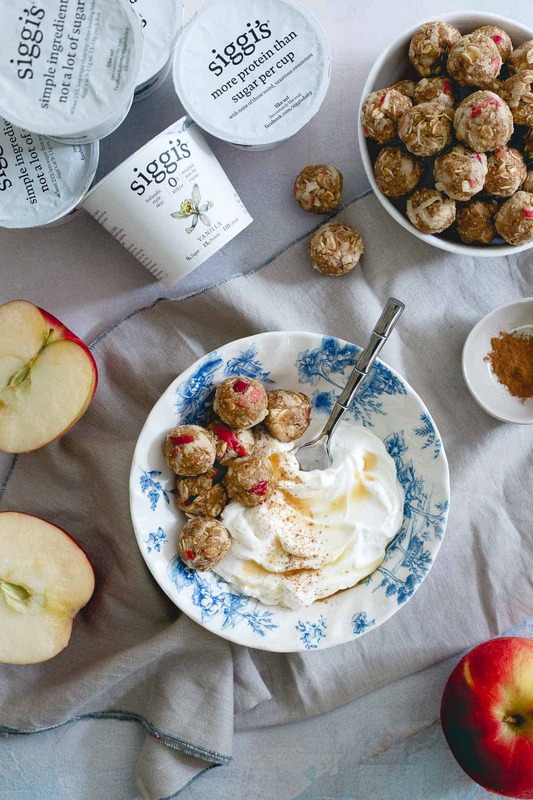 *This recipe for Apple Cinnamon Cookie Bites is sponsored by partner, siggi’s. All content and opinions are my own. Combine the oats, oat bran, cashew meal, cinnamon and salt in a large bowl and stir together. Whisk the cashew butter, maple syrup and extracts together in a small bowl until well combined then add to the bowl with the dry ingredients. Mix together using a spatula until mostly combined. Squeeze most of the liquid from the grated apple then add to the bowl and incorporate using your hands until just combined. With slightly wet hands, roll a heaping teaspoon worth of the mixture into balls. Keep refrigerated in an airtight container for up to a week. You can make your own cashew meal by processing plain, un-roasted, unsalted cashews in a food processor or blender until the texture of fine meal/course flour. I always forget about yogurt as a great snack – I need to buy it more. I love these cookie bites too, I’d eat al of them! siggis is definitely one of my favorite!!! i love how Fall inspired this is..
Yessss, I love that yogurt is so versatile and always makes a great platform for toppings and other good stuff!! Apple cinnamon bites!!! You nailed it. Siggi’s is the only yogurt my daughter will eat and I especially love that it’s so much lower in sugar and higher in protein than most. 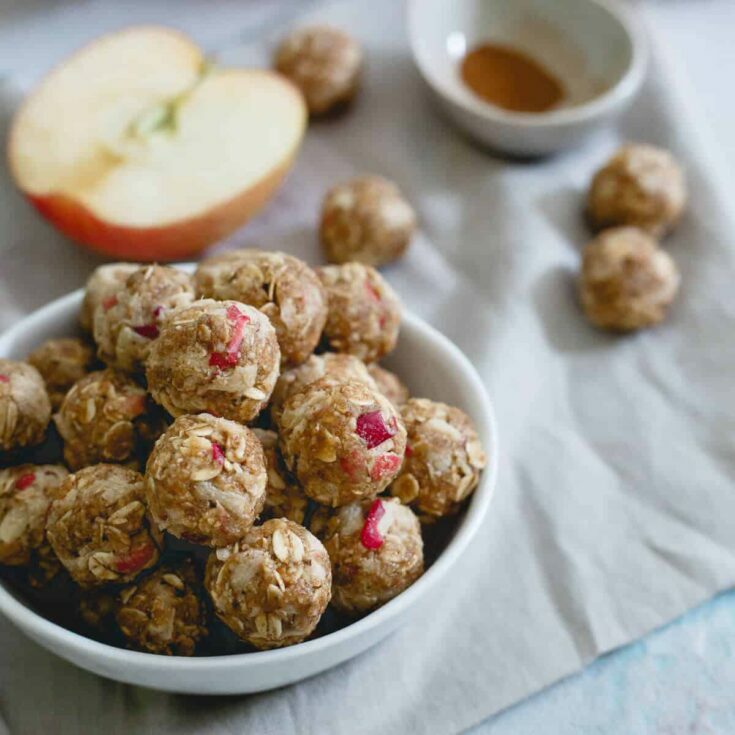 These apple cinnamon cookie bites sound perfect for a school snack. What brand of cashew butter do you like to use? If we don’t have oat bran, how can we adjust the recipe? E.g., can we increase the amount of oats? Increasing the oats should be fine.